Three years ago, Parker and I graduated college and were looking for something "fun" to do. After a not-so-long walk to the park, we had made up our minds... we were moving to Las Vegas. What could be more "fun" than that?! We were young, we didn't have jobs or much money, or any idea what to do when we arrived in Vegas, but we knew we would make it work. After all, that is the way do things - we are NOT planners. A couple short months later, our bags were packed, tears were shed and we were out on the road for a cross-country road trip! Vegas or bust was our mentality... and bust we almost did. After our first stop our car broke down and needed a $900 repair to get moving again (which was about one-third of all the money we had to our name). 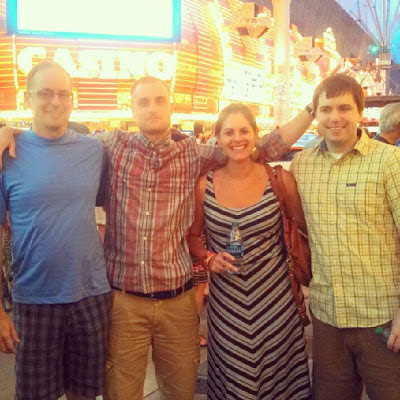 After seeing Chattanooga, New Orleans, Austin, and Albuquerque we finally arrived in Las Vegas! 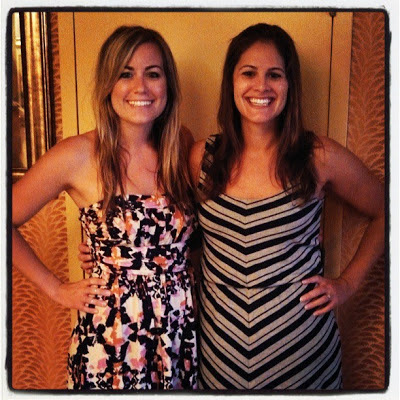 It was hell for both of us to find jobs and took much longer to get on our feet than we had initially anticipated. We could not have done it without the help of our family - most of all my sister-in-law who let us rent some rooms in her house. We love you, Romy! Once we did get settled, we were amazed by how much we loved it here. It is here where we got our first "big people" jobs, got engaged, made new and lasting friendships, and created (then disbanded) 3 different businesses -ha! It is here that we learned we could do anything we set our mind to... and we could do it together. As I sit here, only an hour away from leaving the city we have called home, I am teary-eyed thinking of all I am leaving behind. All the friends, families, and students I have met have given me so many memories that I will keep for a lifetime. I am anxious to get started on the next chapter of our life together as we look forward to getting married, starting our family, revisiting our old friends and family we have left on the East Coast, and our exciting road trip that starts right about n-o-w! To all our friends here in Vegas - WE LOVE YOU and we can't wait to come back and visit! To all our friends and family back East - we love you too and we are on our way!! I am elated that the days are starting to go by faster. I am officially 3 months away from saying "I do" to my best friend and I must say I am one lucky young woman. The couple from the blog like to give a small metal box with a story inside as a wedding gift. The story is about an older couple who got married with very little money to have a honeymoon. They made a pact that each time they made love, they would put a dollar in the box and save it for their 50th anniversary. The couple saved and saved and eventually put the money into a savings account and then bought CDs. On their 50th wedding anniversary they were able to have a lavish vacation in Hawaii - all expenses paid! 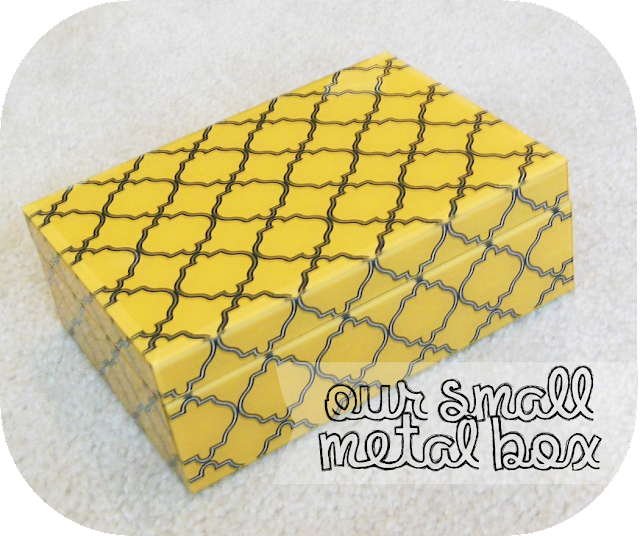 As their own children grew up and got married, they shared this little secret with them and got them their own metal boxes to start saving. Parker and I thought this was such a fun little way to promote intimacy in our relationship and save for a few big vacations along the way! We are going to put $5 in each time and use it every 10th anniversary. Hard Rock pool = crazy drunk people and lots of sweaty dudes. The pool at the Golden Nugget surrounds a huge shark tank. That clear tube in the middle? A slide to go right through the tank! 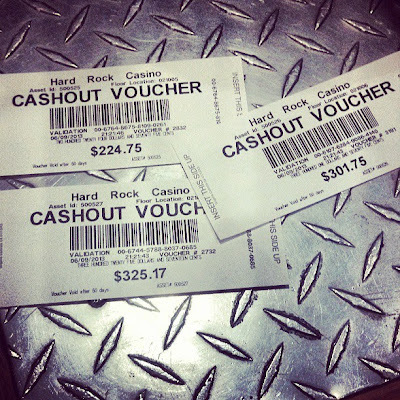 While they were here, we were lucky at Hard Rock! Sister-in-law and I before a delicious steak dinner! Crazy lighting on Freemont street with the father-in-law, brother-in-law and the hubs! Needless to say, I have been enjoying my last days in Vegas, but now I need to start planning our road trip!! I am only 26, but this pretty much sums up my life on a daily basis! I have been slacking in my "Suzy Homemaker" role at home so I thought this would be the perfect opportunity to put the apron back on and make a delicious meal. 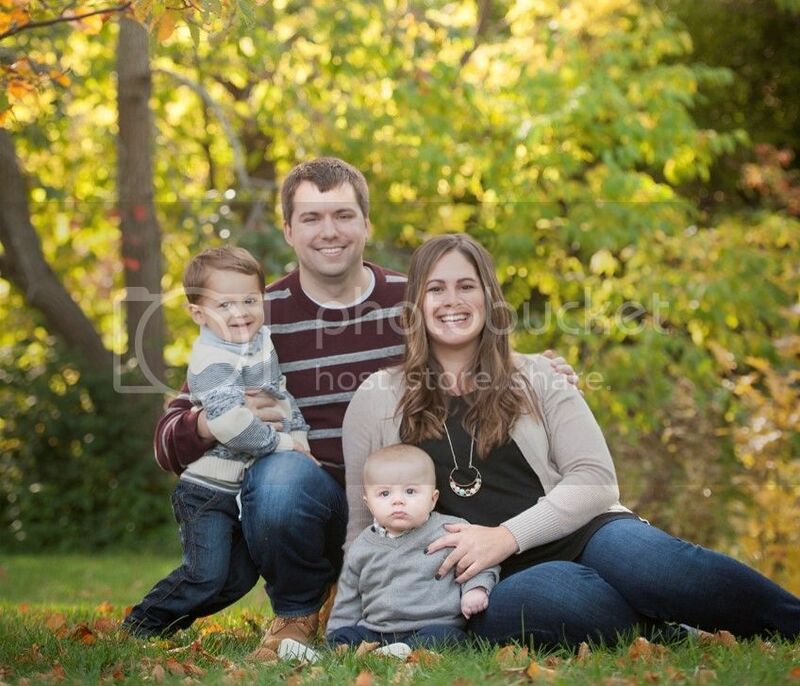 I was lucky that the future hubs wanted to help me out! Parker and I looked through our pantry and found some wild rice, bread crumbs, and olive oil so we headed to the grocery store to see what else we could add to this mix. 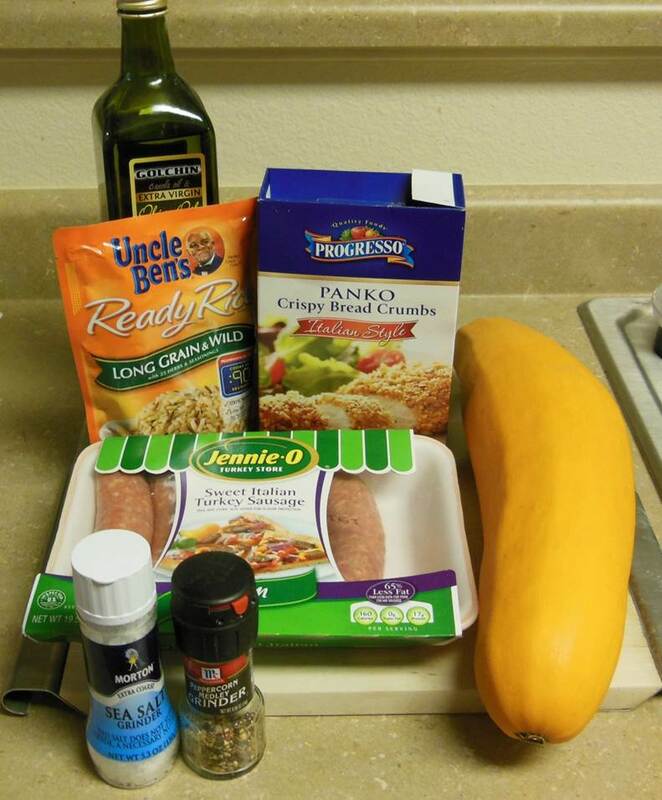 We love some Jennie-O and found this Sweet Italian Summer Sausage we thought would work just fine! 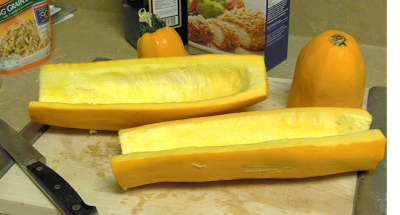 First, Parker chopped off the ends of the squash and cored it. No worries, we didn't waste any of this squash. Parker chopped up the rest to add to the stuffing. While Parks was dealing with the squash, I removed the turkey sausage from the casings, sprinkled it with salt and pepper and began to brown it in a large skillet. In a small skillet, we drizzled a little olive oil on the extra summer squash and cooked it just a few minutes until it was tender. When the sausage was browned, we added the pre-cooked rice and the squash to the pan and mixed it all together! 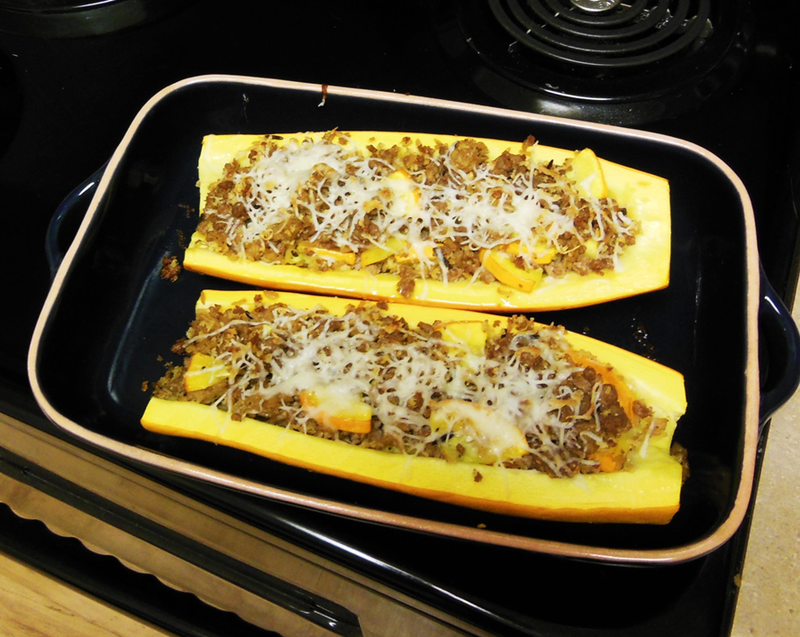 We added the mixture to the squash boats and cooked them in the oven at 375 degrees for about 15 minutes. Right when we put the squash in the oven, we decided we needed a little summer ale to go with our dinner. I ran to the corner store real quick to grab some Sam Summer and a little mozzarella cheese to sprinkle on top of our meal. and VOILA! 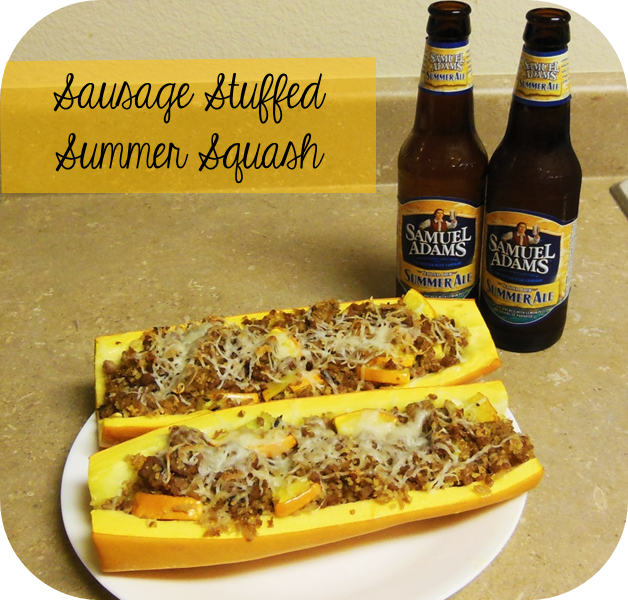 There you have it: Sausage stuffed summer squash! An easy, delicious meal that was fun to make! Major thanks to my student, Kate, for the thoughtful gift! 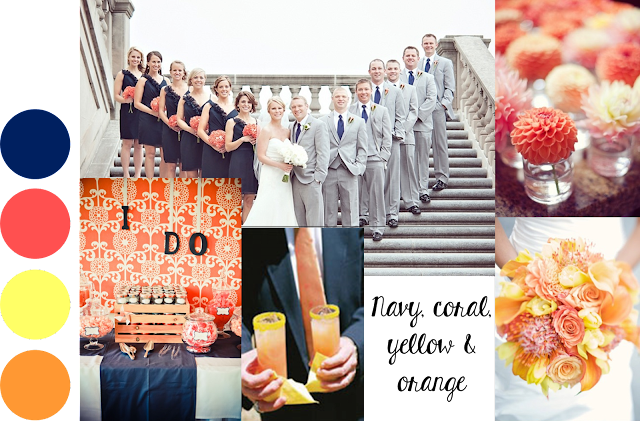 It is about time I finalized our wedding colors so I can start thinking about decor! Our wedding is September 20th. It is right on the cusp of Fall, yet summer doesn't feel quite over yet. Knowing this, I wanted my wedding to feel like a mix of my two favorite seasons! 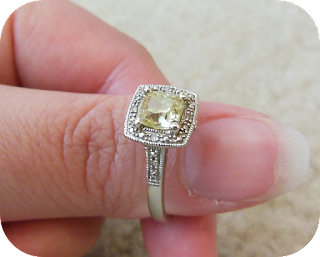 Parker and I love the color yellow so we knew we wanted to incorporate it in some way! It is the color of my engagement ring after all! After yellow, I knew I wanted coral and orange. I also knew that although it is a Fall(ish) wedding, I didn't want my yellows and oranges to be the deep, dark, true Fall colors. I wanted brighter and cheerier yellows and oranges. Lastly, we had to pick a base color which would also be used for my bridesmaids dresses. 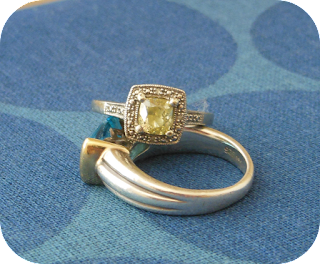 My 4 bridesmaids are all sorts of different in terms of shapes, colors, and sizes so I wanted a color that would flatter all of them. In comes navy! It was the perfect neutral and flatters all my best ladies! I think it'll do just fine!